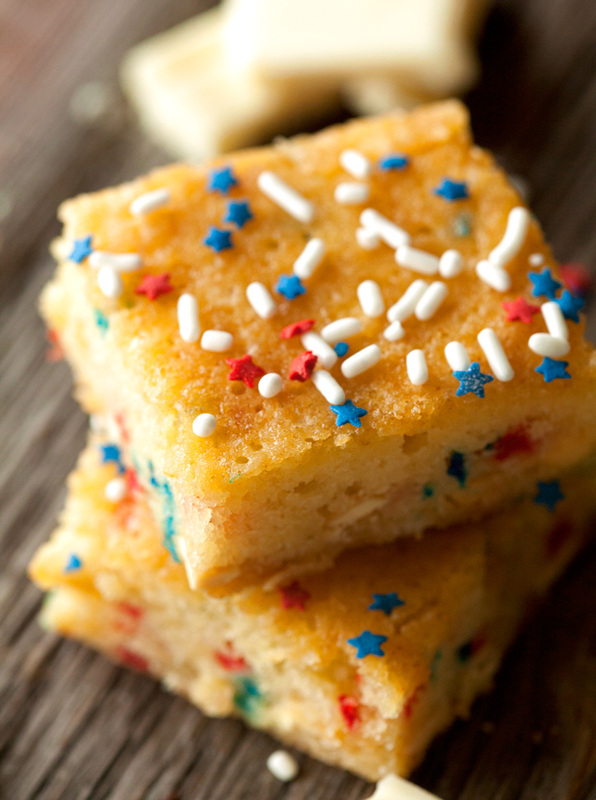 Celebrate the 4th of July with White Chocolate Firecracker Brownies. The perfect dessert for an ultimate flavor explosion. Welcome to another Monday. How was your weekend? Ours was packed with lots of friends and family time – the best kind. Even though we barely spent a couple of hours at home, I was able to whip up some fun things perfect for the 4th of July that I will be sharing this week. It was about time that I made something yummy to celebrate the holiday with, especially since Independence Day is one of my faves. Seriously. Independence Day has always been about swimming in the pool, having a BBQ, enjoying good company and watching beautiful fireworks while appreciating our nation and all the blessings we receive as Americans. And a great holiday deserves a treat that is equally as fabulous. 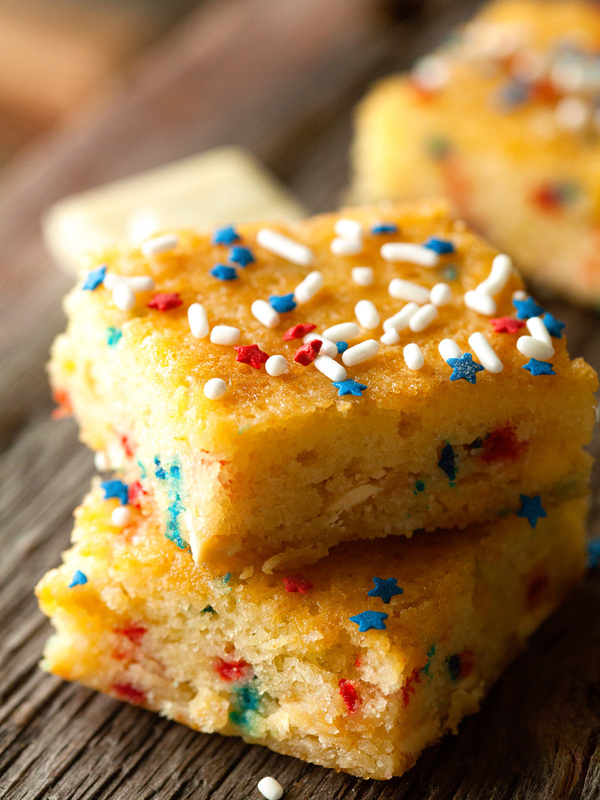 White Chocolate Firecracker Brownies are definitely the answer. Oh, get ready, get ready, get ready! I feel like these brownies deserve a fair warning. They are not for the faint of heart. 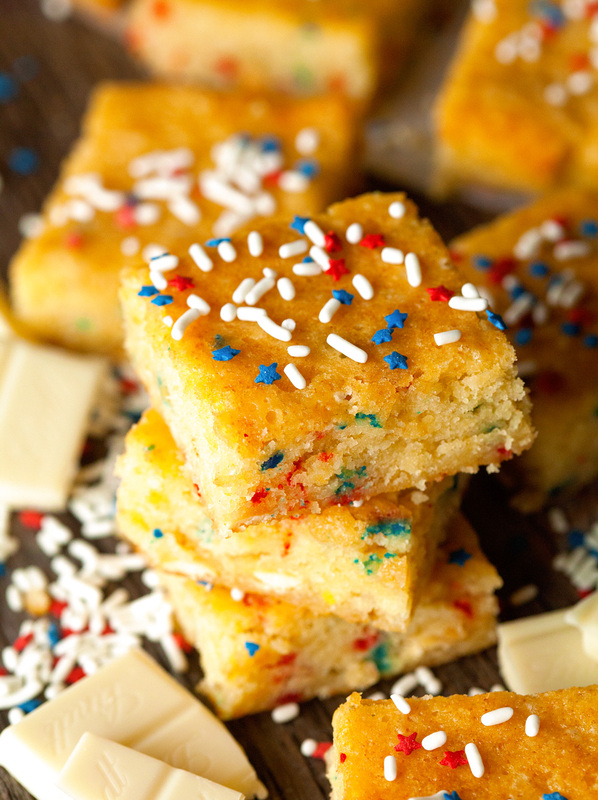 White chocolate gives them such a rich and decadent flavor that will blow your socks off. More than okay with me since I love all kinds of chocolate – white, milk, dark and anything in between. White chocolate always has had a soft spot in my heart though. When I was a kid, I spent a couple of weeks every summer at my aunt’s and uncle’s farm. Some of my best memories were made there. For example, my uncle and I would sit outside at the end of the day listening to the lake nearby, talking and enjoying a couple of pieces white chocolate. I still think about those moments every time I buy a bar of white chocolate, especially in the summer. It’s actually pretty easy to describe what they taste like. Think regular brownie, but swap the milk or dark chocolate with white. Pretty easy, huh? They are every bit as scrumptious, gooey and chewy as the brownies most of us love so much. The addition of red, white and blue sprinkles totally sets ’em over the top and definitely makes them taste that much better ;). Yep, you should make them ASAP! 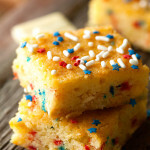 Make perfect White Chocolate Brownies for your 4th of July party or any other day of the year - this recipe deserves a spot in your recipe box! 1. Preheat oven to 350 degrees F. Grease an 8-8-inch baking pan with nonstick spray or butter. Set aside. 2. In a medium bowl, whisk together flour, baking powder and salt. Set aside as well. 3. With the help of a double boiler*, melt butter and white chocolate and stir to combine. Remove from the heat to cool slightly. 4. In another bowl, whisk together sugar, eggs, and vanilla until combined. Using a rubber spatula, stir white chocolate mixture into the wet mixture and mix until incorporated. Then stir in the dry ingredients until just incorporated. Fold in chocolate chips and sprinkles. Pour batter into the prepared baking pan and bake for 25-30 minutes or until set. Let cool before cutting. Brownies will keep up to 5 stored in an airtight container at room temperature. *It is important to use a double boiler when melting together the white chocolate and butter as the white chocolate tends to burn quickly in the microwave and won't combine well with the butter. Simply fill the bottom of a saucepan (or double boiler) with 1 inch of water. Bring water to a simmer and place a bowl on top. Make sure the bowl does not touch the water. Place butter and white chocolate into the bowl and let melt completely. These look fabulous! I am totally pinning these! Love these! So festive for this weekend! Such a great memory you have of white chocolate. Ohhh I’m a sucker for white chocolate too! This looks terrific. Pinned! OMG I am so in love with these! White chocolate is so delish especially in bar recipes! Yep, I totally should make these ASAP! 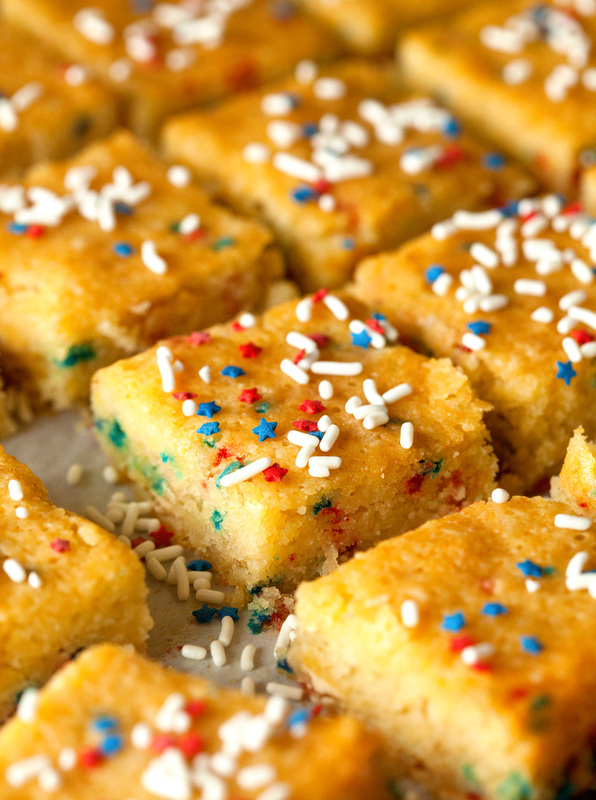 I’m not usually a white chocolate fanatic, but I can never resist a gooey blondie…I’m a total sucker for them! Yay for festive foods! 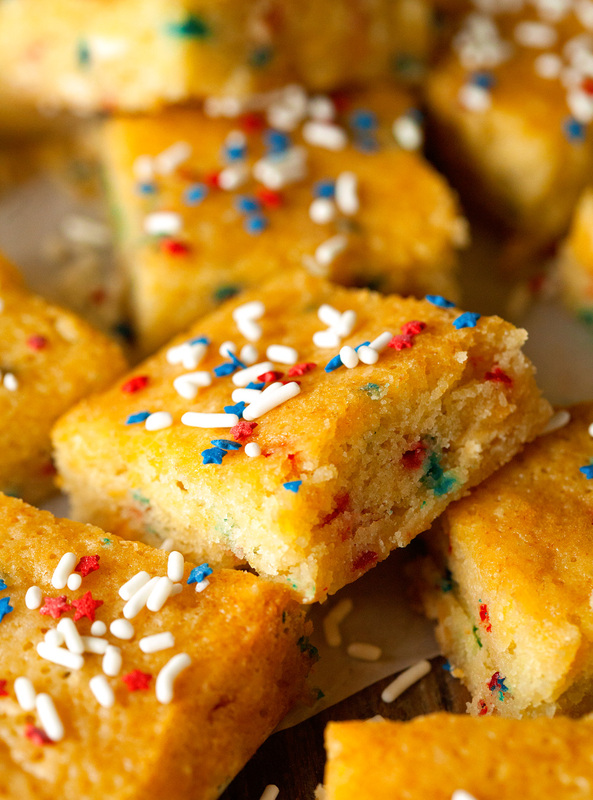 Love these white chocolate brownies – especially with those sprinkles! So irresistible! I need to make these now! White chocolate is what I think makes these brownies so unique. 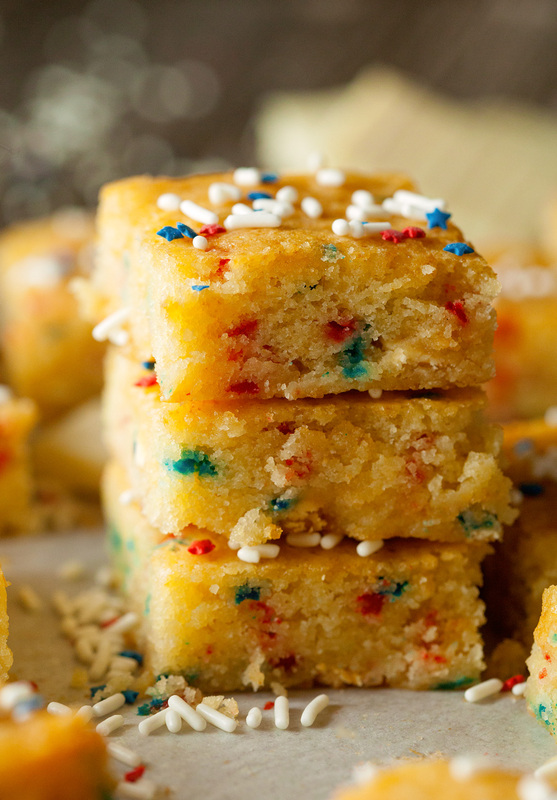 The white chocolate definitely allows you to showcase the red, white, and blue sprinkles. I bet these would be a hit at any gathering! me out loads. I hope to give a contribution & help other customers like its helped me.